This week, had a great turnout for our bright and early (7:30am) hike up the steep Tam-a-lau trail! The Tam-a-lau trail is known in Oregon for it’s spectacular views of many of the peaks of the Cascades, a birds eye view of the 3 rivers that make Lake Billy Chinook, and excellent opportunity to see eagles and other raptors! 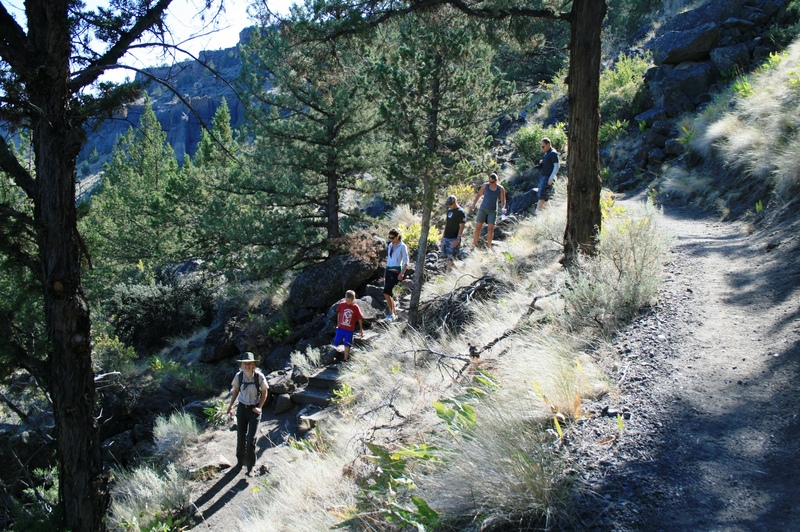 Every Sunday in August the interp team will be leading this hike, free of charge! 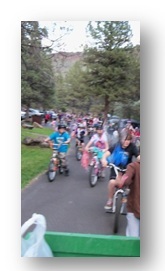 Every Sunday, 7am, at Deschutes Amphitheatre. That’s right folks, at no cost you may lug two waterbottles up a series of switchbacks while dodging rattlesnakes in the hot sun. Sounds crazy? Not at all. The view is unmatchable and completely worth it. A good opportunity to get away from the noisy hustle-bustle of boats and grumpy campers, just you and the breeze and the sweet sound of Talia’s voice whisper-yelling sweet nothings about Juniper encroachment. Awww, nature. We love you. You forgot your tacklebox in the truck. But you do not fret! 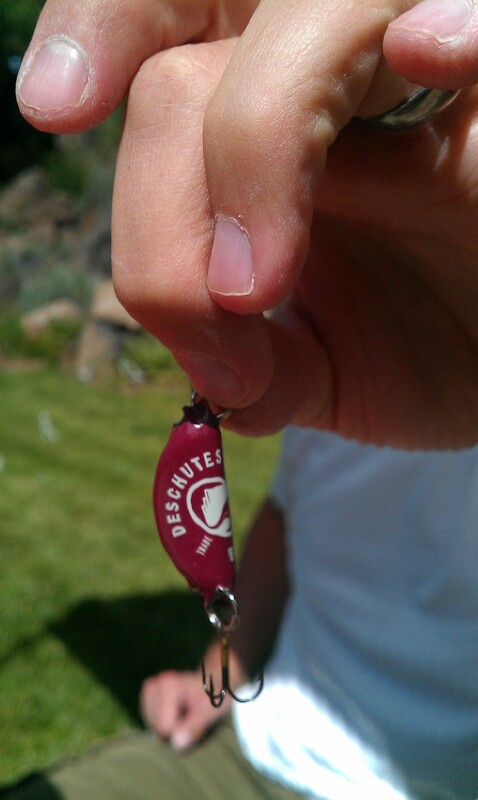 You remember that time you learned how to make a Bottle-Cap Fishing Lure at Cove Palisades State Park! You search the floor of the boat and find an old hook and swivel, and a few rings in your pocket and you are totally set. You take the metal pop top from your “ice cold beverage” and in less than 10 minutes, toss a line and your back to business. Unfortunately, not every fisherman is fortunate enough to have been artfully enlightened by a Bottle Cap Fishing Lure workshop at Lake Billy Chinook. If you happen to be one of those fisherman, there is still hope. 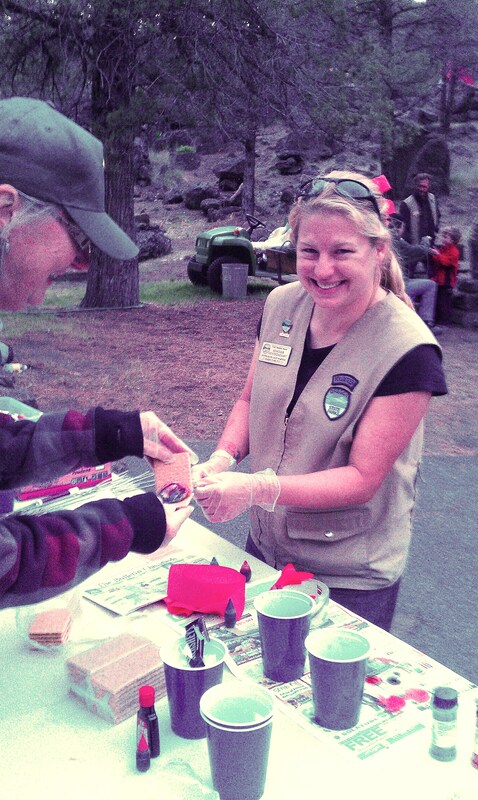 Every Friday for the rest of the summer 2012, the Interpretive Team will be leading lure-making workshops absolutely FREE at the Lower Deschutes Day Use area! Bring the metal bottle cap from your favorite brewski or pop or we’ll provide one for you. All you have to do is show up to save yourself from fisherman’s turmoil on that one day you forget that lucky lure. 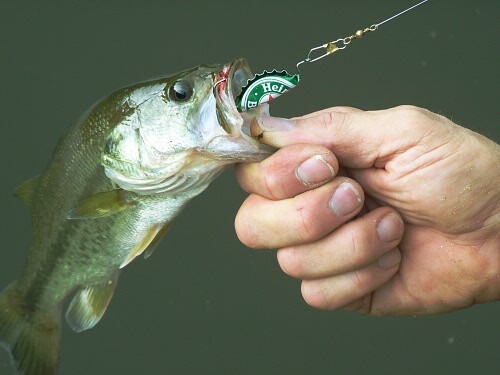 Now supposedly, the small-mouthed bass and the trout like these tasty lures. They are particularly attracted to the caps that have a hint of silver or gold in them. To fancy up these lures, make a noisemaking jig by clamping some bb’s (we also provide those) on the inside, and adding another swivel or two. Check the program calendars at Cove Palisades State Park to view the dates and times of this workshop. Would you like Fry’s with that? As some of you already know, Lake Billy Chinook is formed by the confluence of 3 different winding rivers: The Metolius, The Deschutes, and the Crooked River. These rivers home some of the Pacific Northwest’s most sought after fish by fisherman, including the Steelhead Trout. The steelhead is a rainbow trout that migrates to sea as a juvenile and returns to freshwater as an adult to spawn. Steelhead are not only one of Oregon’s prized gamefish (and fished for at Lake Billy Chinook), but they are also a vital species for the healthy functioning of river ecosystems. They are considered a “keystone” species for watersheds, and when they are removed from rivers, insects overpopulate and there is more limited resource for fish eating animals (humans, bears, and raptors included!). In my journey to learn more about fish in Lake Billy Chinook, I found myself with a few questions. How do these endangered fish make it to Lake Billy, and what can we do to help? Luckily, our neighboring USFW representatives at Round Butte Complex invited me to come along and experience, first hand, one of the many important steps to steelhead and salmon recovery: releasing fry into the streams. 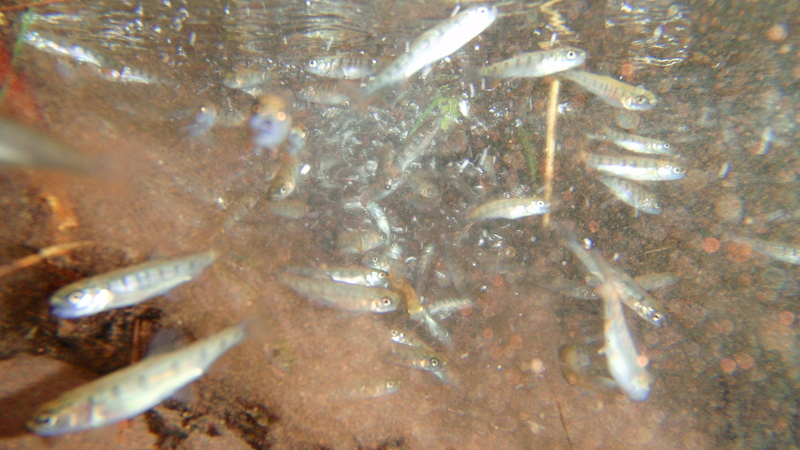 Baby steelhead (also known as fry’s or fingerlings) are released into gentle, cold water creeks that provide for ample environments for survival. 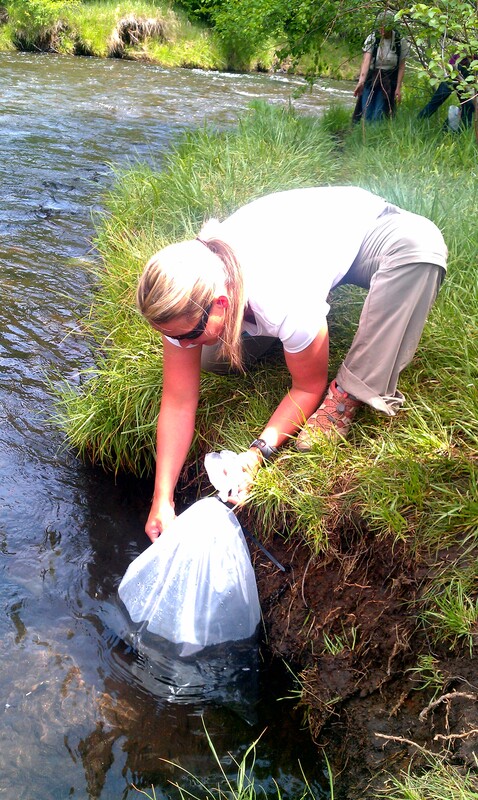 These releases take place throughout the state, in attempt to re-establish species in our creeks, rivers, and lakes. 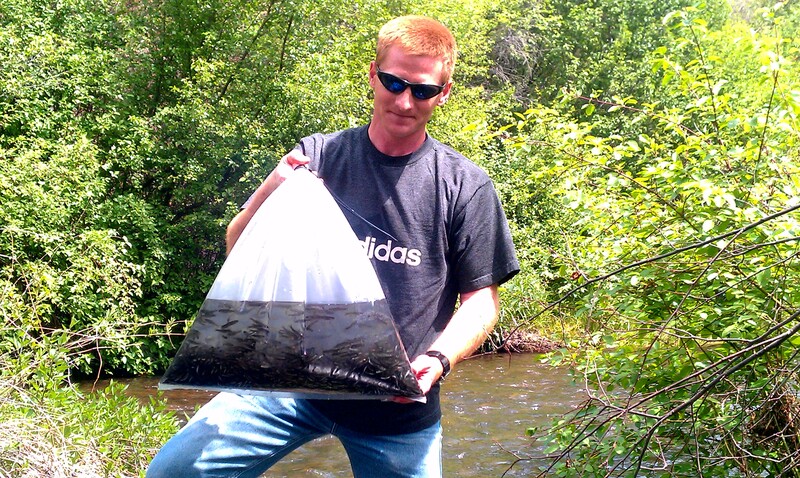 Since 2008, over 1.2 million fry have been outplanted in the Metolius, Crooked River, and Deschutes rivers and adjacent creeks. The process of this fry release was what I would describe as “carefully adventurous”. 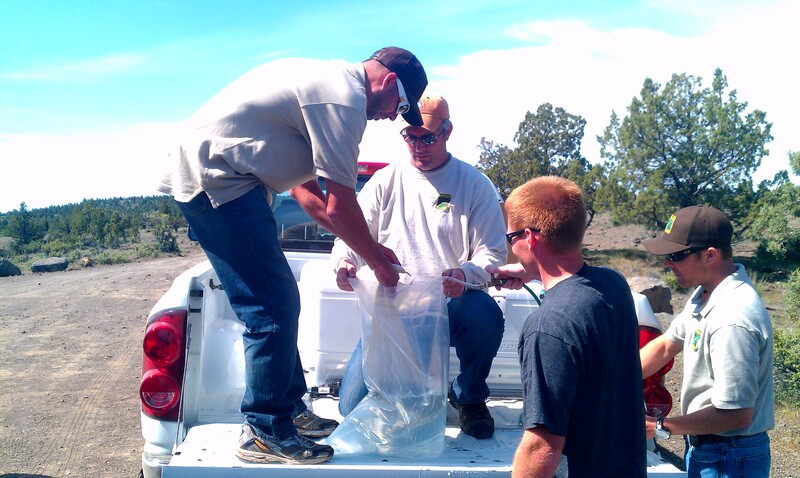 First, thousands of fish are carefully transported from the Round Butte Hatchery near Madras, in containers of oxygenated water, to the destination point. In this instance, the destination point was the trailhead to Alder Creek. 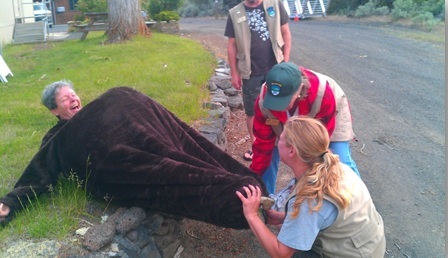 Shortly after arriving at the trailhead, representatives from ODFW, Portland General Electric, The Confederated Tribes of the Warm Springs, and other volunteers prepared their packs for the mile-long journey to come. 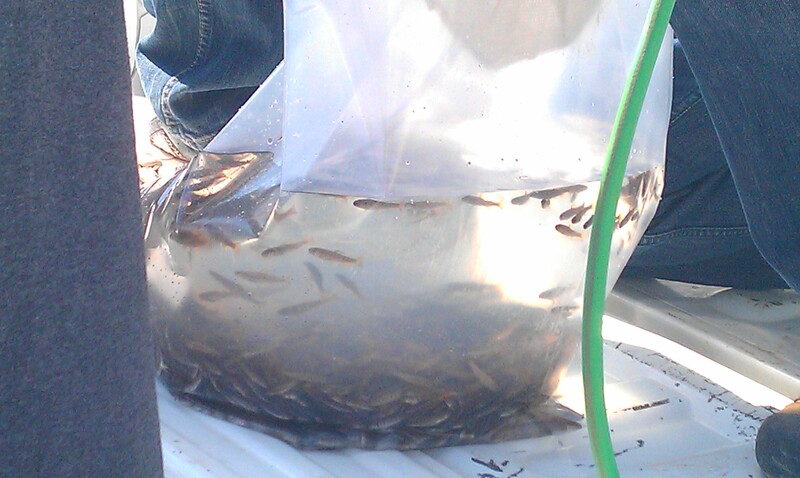 Then, carefully, the fish were placed into 5 gallon bags with oxygenated water, each bag weighing roughly 25-40 pounds. 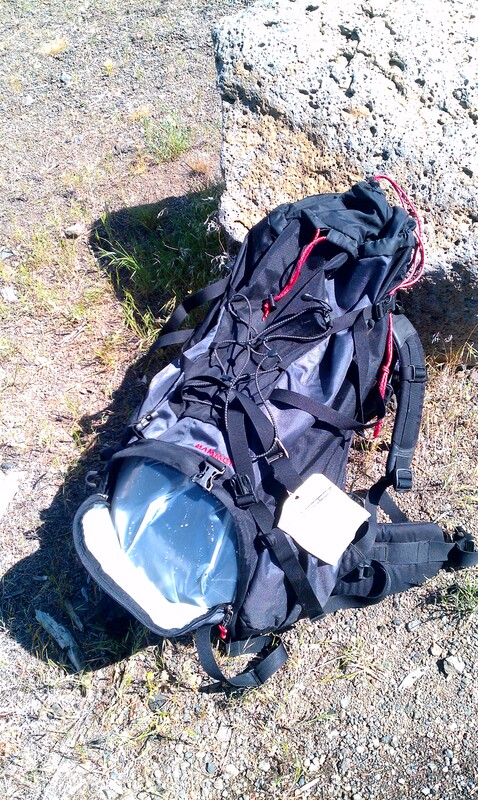 Each volunteer placed 1 – 2 bags in their backpacks to be hiked down to the creek side. 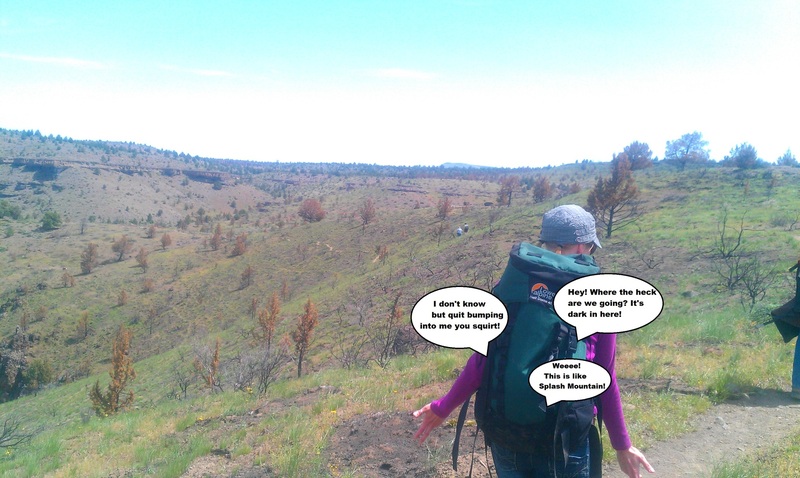 After a beautiful winding hike through exposed grassland, old burn, and wildflowers down to Alder Creek, each individual found an appropriate location to release the fry. 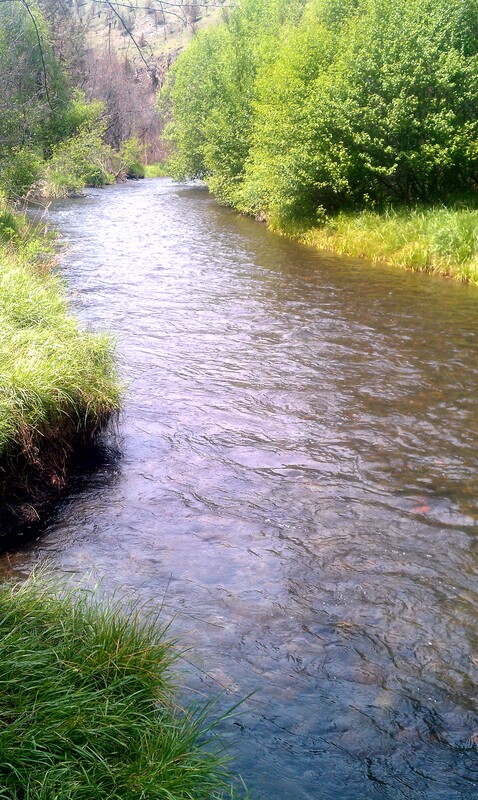 Before releasing the fish, we acclimated them to the stream water for a few minutes, and then, wala!!! Welcome to your new home little trout! 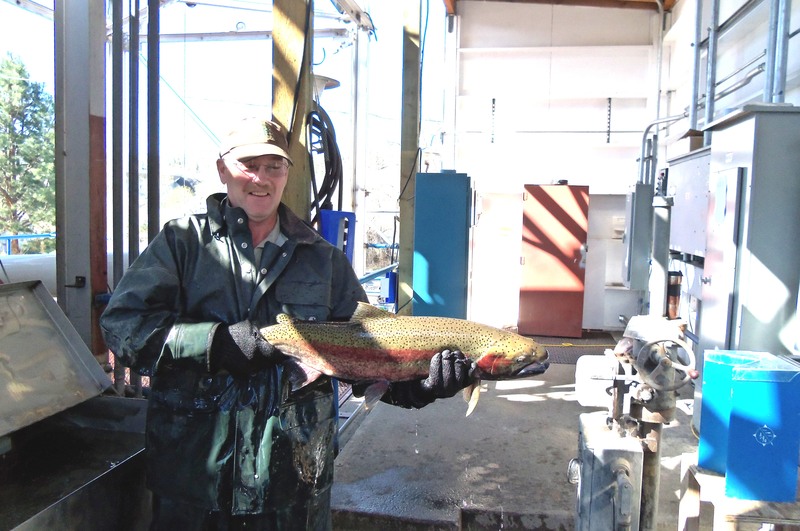 In the long term, fish specialists are hopeful that there will be positive populations of not only steelhead, but Chinook and sockeye salmon in Central Oregon’s rivers. It was really awesome to gain this perspective of all the work that agencies, councils, conservation groups, and other special interest groups are doing to keep our rivers healthy and flourishing with fish. Can’t wait for these little guys to return to Lake Billy in Chinook in a few years, and feel lucky to be a part of their journey to the ocean and back! Oh, where do I start? Memorial Day Weekend at the Cove was a rip-roaring good time this season! In honor of Memorial Day, the park was jam packed with red, white, and blue opportunities to express American patriotism, and celebrate a weekend of remembrance during the usual boating and fishing. 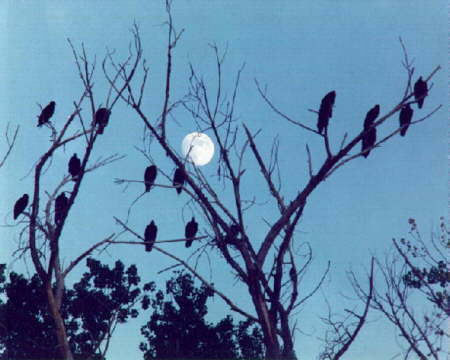 The weekend was introduced with a vivacious vulture activity, complete with lots of slimy, drooly vultures greeting visitors at the “Vulture Tree” in Deschutes Campground. They put on quite the show! The Hosts and Cove Crew came together to bring visitors multiple fun options on Saturday, wind n’ all. 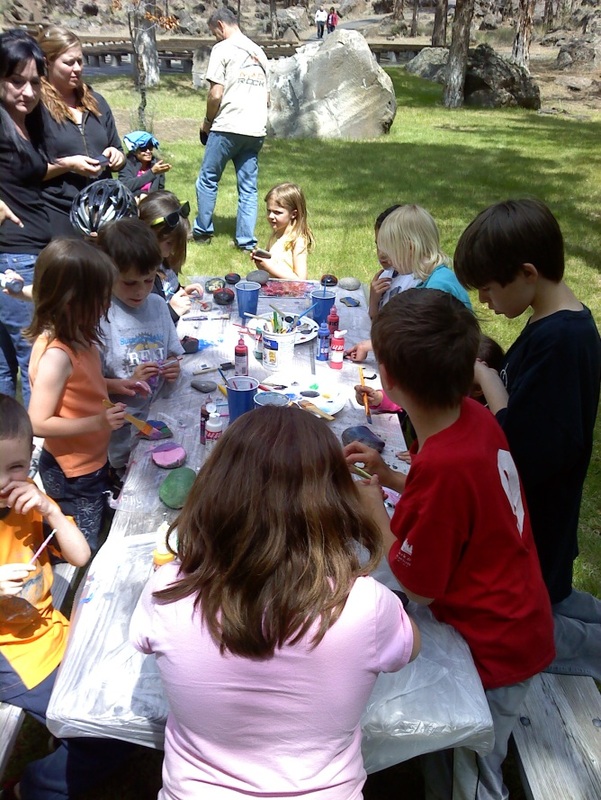 Park goers could “see, grab, and nest” like an eagle during our Bald Eagle Day activities at Crooked River Day Use. The biggest hit: using “litter pickers” as talons to quickly SwwwOOOOP and grab weights like an eagle would with it’s talons! 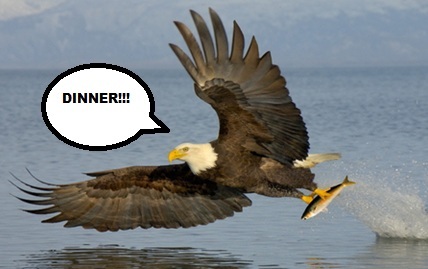 Turns out that hunting for fish like an eagle takes precision, momentum, and skill! Star-Spangled S’mores and Trivia were a BLAST on Saturday night! I discovered a neat way to make a “tie’dye”effect of red and blue on marshmallows (you wet them first!) using food coloring. The winners of trivia got a second round of s’mores! Speaking of tie-dye, that took up most of Sunday! Anticipated to be a sleepy, slow Sunday, nearly 45 people showed up with their clean socks, t-shirts, and pillowcases to tie-dye them red, white, and blue. (Can you tell I like to tie-dye?) Kiddos also got the opportunity to paint a “Memory Maker” cobblestone. Kids and adults alike got an opportunity to sport their fancy new tie-dye fashions during our 1st Annual Cove Palisades State Park Memorial Day Weekend Parade (Say that 5 times fast!) 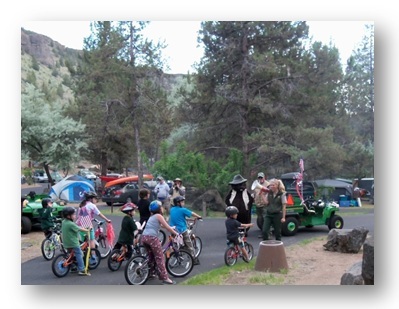 It was so wonderful to see campers deck out their bikes, helmets, scooters, and more to celebrate in remembrance of Memorial Day with a march around the campground. Those who had hot-dogs cooked gave a big cheer for the parade goers as they marched on by. Leading the way, our awesome Cove hosts, myself, and Jr Beaver! Good showing: over 100 people! We had lots of fun getting one of our hosts into the JR Beaver suit. Would you guess it takes nearly 6 people to get that suit on? Lots of laughs.